We know the joy and pain of Starbucks' holiday menu item releases all too well -- they're delicious but ephemeral, destined to disappear once supplies of pumpkin spice are drained (that is, unless you hoard the stuff obsessively). BUT! Starbucks has decided to give us all something more permanent to sink our teeth into with their newest core menu item -- the "Flat White," which already has many fans in Australia. And it's dropping today. But what is a Flat White, exactly? Well, it's made from two shots of ristretto (a more concentrated, thicker espresso) topped with "a thin layer of velvety steamed whole milk" microfoam (with small bubbles) that's folded into the ristretto and finished off with a dot of pure white steamed milk. This will be a core menu addition, meaning it'll join the pantheon of Americanos, macchiatos, and cappuccinos that you can already find in every Starbucks across America. 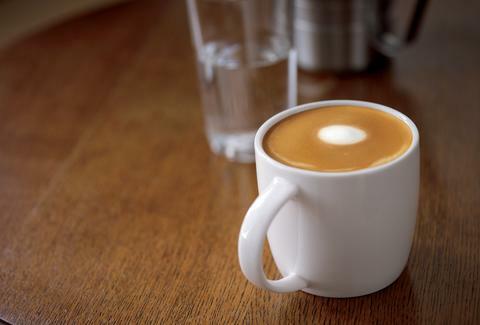 You can find the Flat White at your local Starbucks right now. So go do that. Adam Lapetina is a Food/Drink staff writer for Thrillist, and wonders how long it'll be until Starbucks starts selling Bundaberg. Read his musings at @adamlapetina.